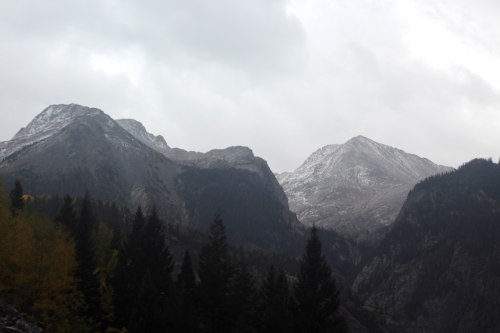 September 22: I woke up and for the first time since I started the hike, the morning wasn't clear and sunny. I looked outside to check the weather--the storm was supposed to arrive today. It wasn't snowing, but it was raining. The snow wasn't far away, however, visible in the mountains maybe 500 feet up. Just a dusting for now. I ate breakfast and brushed my teeth, then headed into the lobby of the hostel with my laptop to do a bit of work which is where I was when two women entered the premises looking to take a shower. So far as I know, this hostel is the only place in town that will provide showers for people who aren't necessarily staying there and has a sign out front promoting showers for $8. I'd seen Jan wandering around not long before so I knew she was there, but not in the lobby itself. Being a one-person operation, she couldn't stand at the front desk all day. She also had to do everything else--wash sheets and towels, clean the rooms, empty the trash, vacuum the floors, etc. So she wasn't in the lobby when the women arrived, but she has her number listed with a note to text her if anyone needs her. The women didn't bring their phones, though, and couldn't text. No problem, though--I could text Jan. I pulled out my phone and texted her about the two people who wanted a shower and expected Jan would walk in seconds later--she always had before whenever someone texted her (including myself when I first arrived). She was in the building somewhere, after all. But a minute or two goes by, and she hasn't shown up. She also hasn't replied to my text. I chatted with the women saying that I'm not sure what happened to Jan--usually she's there in seconds. Perhaps she had to run to the general store in town real quick, but I figured she'd have texted me back if that were the case. I was absolutely baffled about what happened to her. I swear that 90% of the economy of Silverton is based around the arrival and departure of these trains. Another couple of minutes go by and still no sign of Jan, and I told the girls that I could take their $8 each and give the money to Jan when I saw her. They didn't want to wait anymore and were perfectly happy with this arrangement. They asked if there was a discount if they used their own towels and I didn't know--I didn't know anything about discounts, and I had no way to ask. It's not something I felt like I could authorize, though, and told them as such. If Jan arrived or replied to my texts before they finished their showers and left, however, and she allowed a discount, I could return whatever the discount was. They gave me a $20 bill, and I looked for an envelope behind the desk where she had change for Nicole and I to handle guests who arrived yesterday (when we actually were minding the store! ), but I couldn't find it. There was nothing to break the large bill, but I had enough change in my wallet to break it and returned $4 out of my own pocket. I showed the women where the showers and bathrooms were and let them get to work and texted Jan saying that I now owed her $16 for the showers. I went back to work on my laptop when two other people soon arrived also wanting showers. I texted Jan again, "Two more people wanting showers--where are you?!" And again, there was no response. I gave the guys the same offer--I could take their money and give it to Jan whenever she got back from whatever it was she was doing. Which is when I had a flash of insight--maybe Jan was dropping off or picking up a hiker from somewhere? She also runs a shuttle service (that's why she wanted to buy a truck the day before). It would make complete sense if she had to drive out to some remote trailhead to pick up or drop off a hiker and didn't have cell phone service at that location. That must be what happened her! The guys also wanted to pay with a $20 bill, which was a problem for me because I didn't have 4 more $1 bills in my wallet. I didn't have anything small enough to make change. The one guy said no problem--and wound up going back out to his car and getting the correct amount of change. I showed them the one unoccupied shower--the hostel had three in total and the women were already using two of them so only one of the guys could shower immediately. I talked with the other man, curious about where they were staying that didn't have a shower and learned that they were in town for the ultra run tomorrow. They were volunteers that were in charge of one of the aid stations along the route and were camping in a small RV--which didn't include a shower. Ahhh--that makes sense. The girls eventually finished with their showers and I didn't realize it at the time, but the four people were actually all together. They came in separately, though, so I didn't realize it at first. With another shower now available, he left to clean up. I texted Jan and told her that I now owed her $32 for 4 showers. The whole incident made me laugh, though. Yesterday, I spent nearly 8 hours in the lobby waiting to help people and not a single person came in wanting to stay for the night or a shower. This morning, when I wasn't supposed to be "working" at all, I help four people. The last of the shower people finished their shower and as he walked down the hall, Jan immediately zeroed in on him. "Who are you?" she asked. She knows everyone who's supposed to be in the hostel and didn't recognize him. "He's one of the shower people," I told her. "He's okay. He's supposed to be here." Nicole checked out of the hostel, which I was a little sad about. She was part of the "hostel family" we had, but part of her prize package when she won an entry into the race tomorrow included a free hotel room at another place in town for the next two nights. Nicole would still be in town--but staying somewhere else. Probably somewhere on that hoity-toity Greene Street. They get their street paved and a few street lights and they think they're better than us on "notorious" Blaire Street. The street signs actually say this--"notorious" Blaire Street. It used to be where all the prostitutes and bars were located back in the day. So Nicole was gone, and Bushwacker too. Bushwacker had made a reservation at another hotel a week earlier when he thought he'd arrive in Silverton--but he arrived a couple of days early. Now he preferred to stay at the hostel, but he couldn't get out of his reservation at the other hotel so he was leaving. Just for a night, though, then planning to come back to the hostel again. We said we'd save his bed in the bunkroom. In the meantime, a couple of other girls arrived at the hostel who introduced themselves as CDT thru-hikers and--without thinking about it--I asked him what they were doing here because Silverton wasn't a CDT town. Not that I minded them being in Silverton, but most CDT hikers didn't even know the town existed because the trail veered off from the Colorado Trail before passing by here. I realized belatedly that I might have sounded somewhat condescending--like only Colorado Trail thru-hikers were allowed in this town. I was just curious how they ended up in Silverton. Did they take a wrong turn or something? They described a night of horror last night--wild winds that ripped through their tents and the punishing rain and snow. And they knew the weather was only expected to get worse today and tomorrow and decided they had to get the hell off the trail. They got off the trail at Stony Pass--a short way before the CDT and CT split from each other--then got really lucky and found someone to give them a ride--but the ride went to Silverton. Which was the nearest town to Stony Pass so it makes sense they ended up in Silverton. Stony Pass is a gravel road and not very busy so it's not the best place to hitch a ride from which is why CDT thru-hikers don't normally use it, and Molas Pass is closer to Silverton and much busier which is why CD thru-hikers don't normally get off at Stony Pass. Given the severe weather conditions, though, they threw out the rulebook and got off the trail there to wait out the storm. In fact, the hostel was filling up with people wanting to get out of the storm. Our bunkroom added a new member, Max--who was also thru-biking the trail and more than anxious to wait out the snow storm. I headed out into town for lunch. 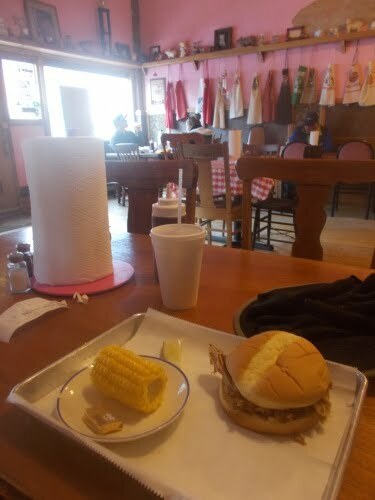 I decided on a BBQ restaurant that I hadn't been to yet--and I wanted to get it before the first train arrived in town. By this point, I've become quite familiar with the downtown frenzy when the trains are in town, and I wanted to get food before the frenzy started. I was a little delayed with handling all of the shower people, but the trains were running late and I made it into the restaurant just before the first train people started arriving. I was placing my order with the girl at the front desk when several other people entered the restaurant. My lunch at the BBQ place--whose name slips my mind at the moment! The girl asked if they were from the train--it was running late, right? They said that yes, they did come in on the train. And I asked the girl why she didn't assume that I had come in on the train. By now, I was clean-shaven, traded out my hiking clothes with street clothes, and smelled--well, a normal people smell with soap and shampoo and all that. "I don't know. You just didn't have that look." I laughed. "Well, you're right. I didn't arrive on the train. So why am I in town?" I asked, curious if she'd peg me as a thru-hiker or not. But she didn't. She couldn't make any guesses about why I was in town--just that I wasn't a train person. "But I do have a reservation to leave on the train today!" I told her. And I did. When I had decided to wait out the storm and realized I would be in town four at least four zero days, I knew I had to entertain myself and a train ride on a historic 1880s train sounded like a fun way to waste a day. 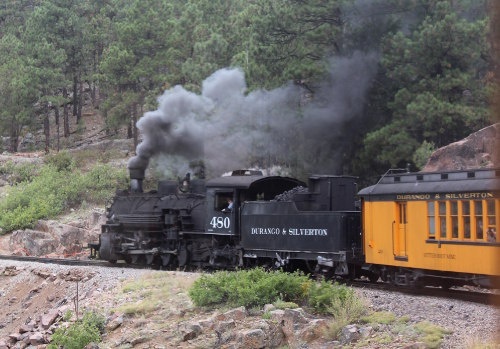 I went into the office two days earlier where one can purchase the train tickets and asked if there was a way I could take the train to Durango and return to Silverton in the same day. I didn't really want to spend the night in Durango--that would mean checking out of the hostel, moving to Durango for the night, then packing everything up again and returning to Silverton the next day. I didn't want to mess around with packing up and moving twice. This was the inside of my train car. It would be filled to near capacity by the time the train left town. 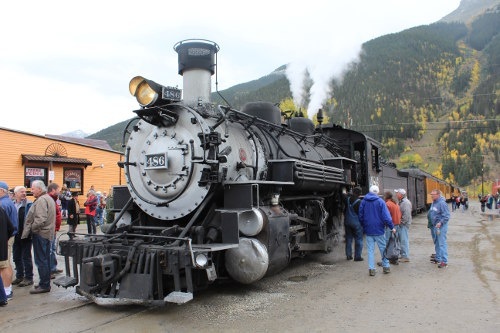 But the trains went from Durango to Silverton in the morning, then return from Silverton to Durango in the afternoon. If I took the train to Durango, I wouldn't be able to take the train back the same day and I wanted to know what options there were--if there were options at all!--to get back to Silverton on the same day. And there was. There's a shuttle van that can take people from Durango to Silverton after the trains arrive in Durango. (At a cost, of course--the shuttle wasn't included with the train ticket!) I had to wait a couple of days, though, because the shuttle vans were full the first couple of days I was in town. Today was the first day I could score a ticket for the shuttle van. 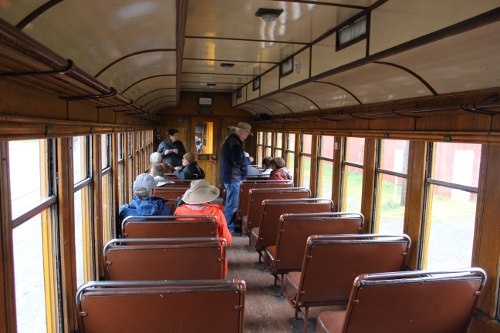 I booked myself on the first of two trains that would leave Silverton which meant that I would have an hour or two in Durango to look around and sightsee before I had to take the shuttle van back. Of course, now that the trains were running late, I'd have less time in Durango. 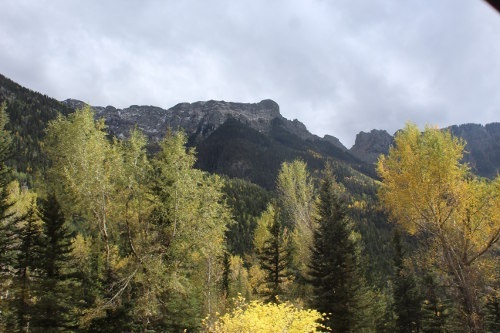 But I'll be going back there at the end of the hike one way or another so I'd have more time to see Durango later. The guy asked me if I wanted indoor or outdoor seating on the train. Out of curiosity, I also asked if the train has ever derailed. The man seemed uncomfortable with that question. "Well, yeah...." he told me, "but they have procedures in place for that sort of thing. It's not like you'll be stranded out there or anything. And nobody has every died or anything if that's what you're worried about." The train cars filled up, and eventually the train whistle blew and started chugging on its way. Lots of wonderful views from the train! There's not actually much to write about the trip, though. The views were spectacular! The train stopped briefly at Elk Creek where a hiker got off the train. I had no idea who he was, but I was surprised. Who would voluntarily go out in this miserable weather? The train went along steep cliffs--if you're afraid of heights, there would definitely be times you shouldn't be looking out the window. 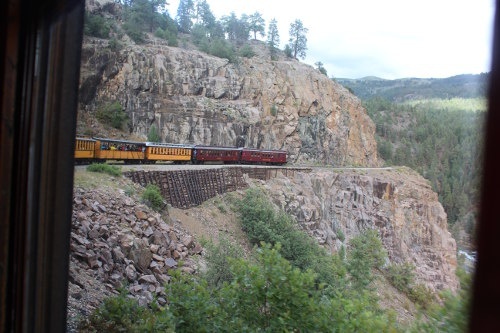 The scenery was dramatic and beautiful, and on some of the sharper turns, I could see the steam engine at the front of the train chugging away. It was wonderful. The conductor came through checking tickets and making jokes about the wimps who had tickets for outdoor seats but decided to take an inside seat anyhow. I didn't tell anyone, but I was also scoping out the route of the train. Bushwacker had been expressing reservations about finishing the trail. This snow storm seemed to put the fear of God into him. To be fair, he is from Florida! Naturally, he didn't want to quit the trail so close to the end, but he was going to wait out the storm and then figure out what he'd do. We had poured over topo maps and used Google satellite views to find potential campsites and places we could jump off the trail if things got too bad. We looked for campsites with trees that could provide protection against the elements--although recognizing that many of them might now be dead due to the beetle infestation. My topo map showed in intriguing location that was labeled "cabin" that nobody else's topo maps showed, so we googled for information trying to find out more about this alleged cabin. Was it open to hikers? Was it in good condition? Strangely, we could find almost nothing about it online, but I did find it in a satellite view of Google maps and from that viewpoint it looked like it was in good condition. The roof seemed fully intact and the building was clearly upright based on the shadows it cast. But were the doors locked up? No idea. I figured if push came to shove, though, we could camp on the porch or next to the structure where it might provide a wind break in bad weather. If things were really bad and I felt like my life was in jeopardy, I wouldn't have hesitated to break into the cabin if I had to. If you're scared of heights, this train ride might not be your thing.... It comes right up to the edge of precarious cliffs! But another idea that crossed our minds was following the railroad track all the way from Silverton to Durango. It wouldn't be on the Colorado Trail, obviously, and it would be totally illegal, but at least we could connect our steps all the way from Denver to Durango. I got the idea when Jared told me that a lot of hikers will hike from the trail into Silverton along the railroad tracks--it's the closest, flattest way to walk into town from the trail. That's only five or six miles--from the trail to Durango along the tracks is probably 40 miles or more, but if it's doable in one direction, why not the other? So Bushwacker wanted a first-hand report about the train route since I planned to ride it anyhow. Would it be doable? Could he do it safely? And.... there were a couple of trestles that I knew he wouldn't want to go over, but the river below was low enough that he could wade across if he didn't want to take the trestle. 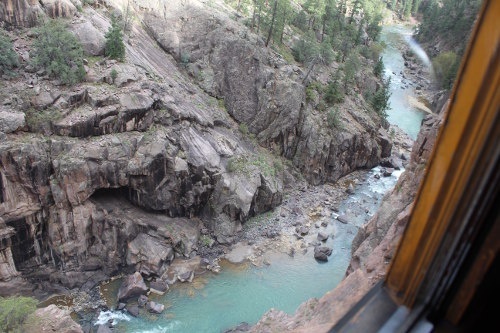 There were some areas along a narrow, steep cliff that could be precarious if he were caught out there when a train came--but there were only two trains a day to Silverton, then two more when they came back to Durango. Those were the only trains that used these tracks--it's a narrow-gauge track that normal trains can't go on--so they were scheduled and predictable. It would be easy enough to wait out sketchy areas until the trains had already passed. 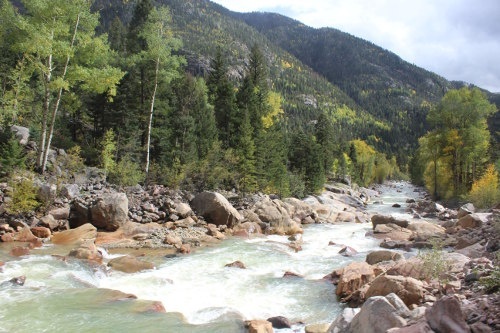 And it seemed to me like there were plenty of places one could set up camp nearby, and it follows near Animas River all the way into Durango so finding water wasn't difficult. I decided it was technically feasible, although maybe not ideal. The worst part, I thought, would be the end near Durango when the train started going through backyards and alongside roads. If he walked the tracks there, people would likely see him and might call the cops on him. Although at that point, he could probably just walk on the nearby roads, but road walking has its own problems and dangers. Anyhow.... I decided that walking the tracks into Durango was possible, but not something I'd recommend. As the train approached Durango, the weather improved dramatically. 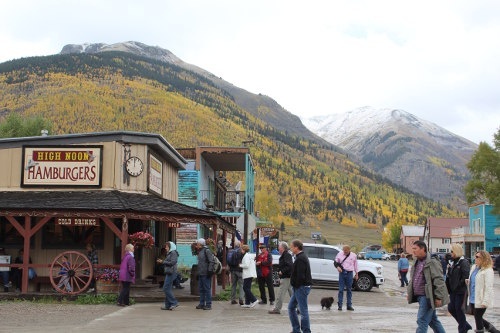 Durango is located thousands of feet lower than Silverton so it was warmer and the snow was never predicted to reach Durango, but it was predicted that it would rain all day. But when I arrived, the skies were mostly clear! I wondered what the weather in Silverton was like. Was it snowing there yet? Was it pouring buckets of rain? Or had it cleared up in Silverton as well? I had no idea. On tight curves, I got pretty good views of the steam engine chugging down the tracks! After arriving in Durango, I had about an hour before I needed to catch the shuttle back to Silverton and decided to use the time to run into Alberton's and resupply my food for the next section of trail. The food selection in Alberton's was far larger and better than anything I'd find in Silverton! And probably cheaper too. It took me about 10 minutes to walk to the supermarket, and I spent a frantic 15 minutes purchasing everything I needed which I stuffed into my backpack, then another 10 minute walk back to the train station where the shuttle bus would be waiting. I knew the shuttle van wouldn't leave until the second train had arrived in Durango, and I was on my way back when the second train arrived. I stood next to the tracks and took photos and video as the train rolled into town. Beautiful! I finished the trek back to the train station and had about 15 minutes to wait for the shuttle van back to Silverton. The second train followed a half-hour behind the one I took into Durango so I could stand outside and film its arrival into town.